Aloha! This beautiful, amazing, bohemian book arrived today & I finally got to browse through its pages. I have wanted this book for over a year & it has been so difficult trying to get hold of a copy. Firstly I could only find sites that shipped to the US which was no good for me. I then headed over to amazon & found it was priced at £80+ for a used copy. There was no way I was prepared to pay that much money for a used book. I searched eBay with no luck & eventually gave up the search. 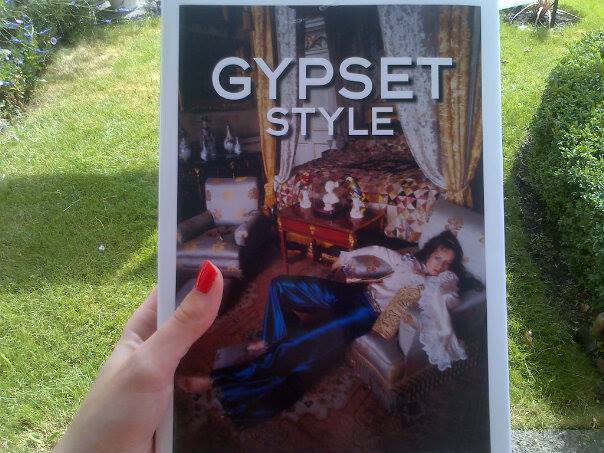 A few months ago I started my search again, I managed to find ‘Gypset Style’ on a website that sold ‘hard to find’ books. I was so excited! I ordered it right away & waited patiently. The website had told me the book was due to be republished & they would send out my order in 3 weeks. I wanted 4 weeks & still no dispatch notice. I ended up having to contact the company, they told me the book was not being republished & was out of stock, I got a refund. I had almost given up completely on ever owning this book when just by chance I looked on Amazon about 3 weeks ago. To my delight they had restocked the book & it was at a reasonable price & brand new. I ordered right away & I knew I would have a little wait because it was being shipped from the US. I started to worry ‘what if it was out of stock again & I had to endure another disappointing refund’! Today all my worries & fears were put to rest when it finally arrived! Gypsetters are artists, designers, and bon vivants who live and work around the globe. Wanderlust meets the height of sophistication as New York Times journalist Julia Chaplin explores the unconventional lives of these high-low cultural nomads and the bohemian enclaves they inhabit. In addition to Jade Jagger, Damien Hirst, and Alice Temperly, the Gypsetters’ counterculture forebears, including the Victorian explorers, the Lost Generation, the Beatniks, and the hippies, are all profiled. The pictures in the book are worth the price alone, so beautiful & inspirational. It is the perfect coffee table book & I am so happy it is finally mine!